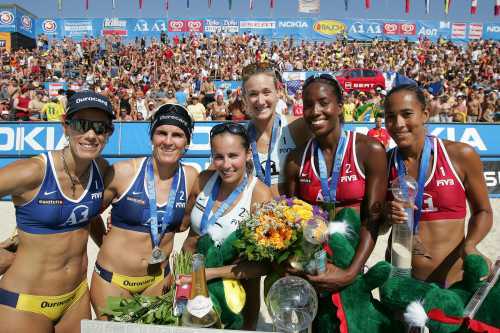 KLAGENFURT 2005 - The SWATCH-FIVB World Tour returns to Klagenfurt, the Carinthian capital city, for the ninth-straight season as the event will feature both men�s and women�s competition for the fifth consecutive year. Since 1996, the event has grown into one of Austria's most successful sporting occasions. It was site of the 2001 SWATCH-FIVB World Champions when a leading Austrian magazine voted Lake Woerthersee Beach Volleyball stop their "best event" ahead of the world-renowned downhill ski race in Kitzbuehel and the Formula One Grand Prix. 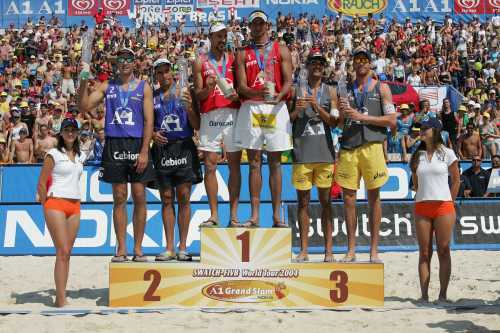 Klagenfurt 2005 will also be the fourth of four �Grand Slam� events on the SWATCH-FIVB World Tour following major stops in Berlin, Stavanger and Paris. Dancing, chanting, cheers and screams are all synonymous with the Lake Woerthersee tournament. Played before capacity crowds on the 8,000-seat centre court, the A1 Beach Volleyball Grand Slam presented by Nokia features six days of thrilling, world-class action, watched by sun-baked galleries in a unique festive atmosphere that never stops. And it's just the perfect ingredients to draw the cr�me de la cr�me of Austrian highlife to this unique lakeside event. Ask those in the know: If it's August, it must be Beach Volleyball at Klagenfurt. Women � After Adriana Behar and Shelda Behar captured their second FIVB World Championship in 2001 in Klagenfurt, the United States captured the last three Austrian gold medals. Kerri Walsh has been part of the winning team each time with Misty May (2002 and 2003) and Rachel Wacholder (2004). Adriana and Shelda have collected four Klagenfurt medals along with $114,000 in Austrian earnings. The best finish by an Austrian team in the four previous Klagenfurt events has been 17ths, including Christine MellitzerSabine Swoboda in 2001, and Barbara Hansel/Sara Montagnolli and Doris and Stefanie Schwaiger in 2004. Pic (left to right): Adriana, Shelda, Wacholder, Walsh, Davis and Johnson Jordan. 2001* - Shelda Bede/Adriana Behar, Brazil / Sandra Pires/Tatiana Minello, Brazil / Eva Celbova/Sona Novakova, Czech Rep.
Men � A 2001 FIVB World Championship victory for Argentina�s Mariano Baracetti and Martin Conde is the only gold medal finish for a country other than Brazil in Austria. Emanuel Rego of Brazil, who has captured five Klagenfurt gold medals with three different partners with $92,250 in earnings, is one of 17 players that have competed in all eight events on Lake W�rthersee. Others are Baracetti ($41,350), Conde ($39,500), Vegard Hoidalen, Norway ($30,325), Jorre Kjemperud, Norway ($30,325), Bjorn Maaseide, Norway ($25,725), Martin Laciga, Switzerland ($23,000), Paul Laciga, Switzerland ($23,000), Jorg Ahmann, Germany ($22,500), Axel Hager, Germany ($22,500), Markus Egger, Switzerland ($21,725), Julien Prosser, Australia ($19,700), Mark Heese, Canada ($19,000), Nikolas Berger, Austria ($18,200), Robert Nowotny, Austria ($8,075), Paul Schroffenegger, Austria ($5,200) and Thomas Schroffenegger, Austria ($5,200). Berger and Clemens Doppler finished fifth for Austria in both 2002 and 2003. Ahmann and Hager, the Sydney 2000 Olympic bronze medalists, are one of three teams to compete in all eight Klagenfurt events together along with the Lacigas and the Schroffeneggers. Pic (left to right): Tande, Franco, Emanuel, Ricardo, Scheuerpflug and C. Dieckmann.